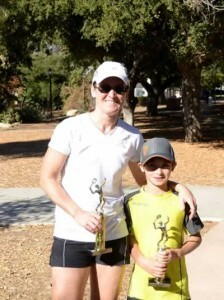 The 3rd Annual Ojai Adult/Child Holiday Tennis Challenge kicked off recently on a dry, blue sky, Ojai day in Libbey Park. A dramatic shift from last year’s near rain out, the 2013 Challenge inspired both lively banter and friendly competition among the intergenerational players. 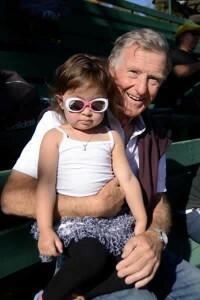 Sponsored by the Ojai Valley Tennis Club (OVTC) and organized by tournament directors, Craig Fugle and Rick Thompson, the event raised approximately $450 for youth tennis scholarships through entry fees. 32 doubles teams and 64 players participated: 16 teams each in the “In For Fun” and “In to Win” Draws. Last minute entries helped fill in some players out with the flu. Every team played two 8 game pro-set matches on Saturday, with winners advancing to the Championship draws and others competing in the Back Draw. Semifinals and finals played out on Sunday. “Excellent play and great sportsmanship was displayed by all, which made this ‘event’ a great success!” said Jakob Vos, OVTC Youth Tennis Chair. Generosity prevailed with Toppers Pizza Place donating a hot pizza and crisp salad lunch, while Friends Ranches provided tasty Ojai tangerines for all participating players on Saturday. Prizes included t-shirts, assorted tennis gear, trophiesand more–donated by the SCTA (Southern California Tennis Association) and the OVTC. No one left empty handed. Various combinations of adult/youth players filled the draws. 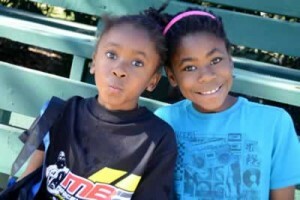 The Adelman family was the largest family group to participate (5), while the Burke family offered 2 parent/child teams. Mike Burke and son Sean, made it to the highly contested Championship Final of the “In to Win” Draw and Carolyn Burke and son, Cole, competed in the semi-final match of the “In For Fun” Draw. 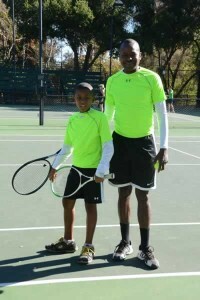 Two local tennis professionals also played with their children–Rick and Jules Thompson (though ahead in the “In to Win” Draw had to default due to illness) and Ryan and Campbell Gaston. New to tennis (6 mos. ), but not to competition, local track Olympic medalist Danny Everett and son, Cole (8), teamed up, while daughter, Karys (10), played with ‘adopted’ adult Leslie Gache in the “In For Fun” Draw. Mike Borders played with grandson, Dalton Willey, winning the “In To Win” Championship Draw. “What better way to spend a beautiful weekend over the Christmas – New Years break than this? This event is so enjoyable, with parents, grandparents and non-related adults playing with kids of all ages and skill levels.” Borders said. 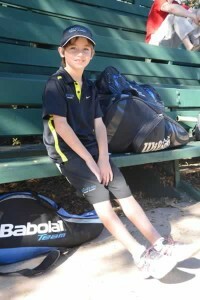 One of the youngest, though highly ranked, junior players to participate this year was local youth, 9 year old Vasyl Yazadzhiev (#7 Singles, #5 Doubles in CA USTA “10 and Under”). Yazadzhiev is son of Dimitar Yazadzhiev, tennis professional at Dimitar Tennis Academy and Santa Barbara School of Tennis. Yazadzhiev ‘adopted’ his adult doubles partner because his Dad was out of the country on business.